Did you know that today is world Jollof day? 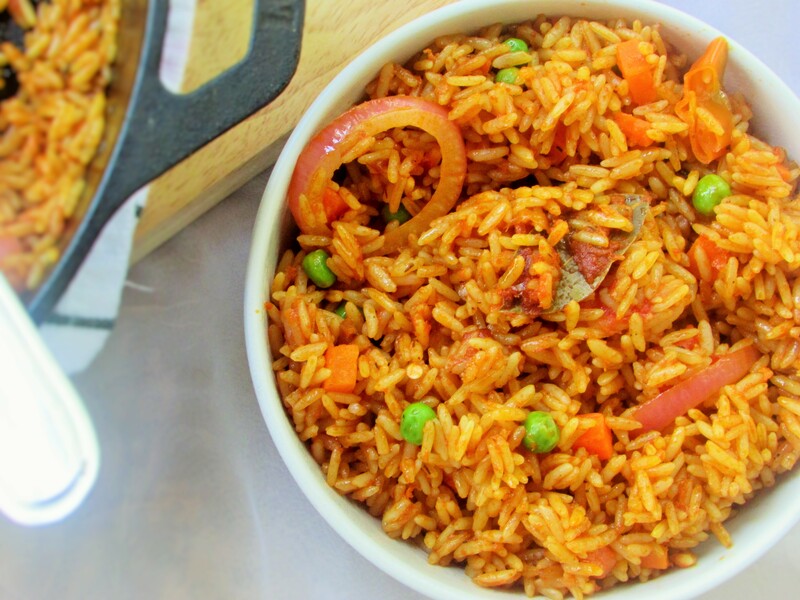 Yes o, a day to eat Jollof rice until your heart’s content and with no guilt! This jollof rice hack had me doing cat wheels in my kitchen. I had used this recipe years ago, but I never thought to post it until recently. I like this method because of how easy it is for me to cook the rice without going back and forth to the kitchen. I just turn the oven on, place my Dutch oven in it and fiam! I am out of the kitchen and sitting with my feet up. I like cooking my jollof rice in the oven because the rice comes out much more dryer than the stove top method. No No No do not frown at the sound of the rice being dry 🙂 It is a very good thing. The Nigerian Jollof rice is much dryer and tastes much better in my opinion. No one wants a mushy Jollof rice you know 🙂 Okay, I do not have the energy to go into the whole who wore it better with this jollof rice thing. I just know I love “Jolly rice” And did I mention the rice never burns with this method? Not one burn! I think Jollof rice can provide world peace, just give these disgruntled countries some Jollof rice and watch them all enjoy together and you would be surprised how peaceful the coming together would be 🙂 Yes Jollof rice has the ability of changing one’s anger to smiles. I think the term jollof means a sweet medley of love and happiness 🙂 If I mention Jollof rice at my home, everyone leaps for joy! Do not mess with the jollof. wash rice under running water until clear and drain. chop and smoothly blend the tomatoes, peppers and one full onion. Pour it into a sauce pan and boil to remove excess water or like I always do ; pour through a fine mesh sieve to drain off the liquid; that way there is no need to boil out the liquid. This entry was posted in Carbohydrate, jollof, Jollof Bulgur, Jollof coconut pasta, Jollof pasta, Jollof rice, Jollof spaghetti, Rice, Rice Recipes, Uncategorized and tagged How to cook jollof rice, jollof rice, Jollof rice recipe, Nigerian food blog, Nigerian rice recipe, Oven baked jollof rice, oven cooked jollof rice recipe. Thanks for the tip. I adopted the baking method cos it was so neat and simple. No hassles like you said going back and forth to see if the rice was soft enough. I didn’t know the same method could be adopted for coconut rice. Thank you, Thank you, thank you! I made some oven cooked Jollof rice today and OMG, I’m never cooking jollof on the hob! It was like eating a proper party rice and it didn’t burn. I used a Pyrex dish so it’s oven to fridge for me. Thanks for this. Lovely recipe. Can I use a normal oven? Hmmn,one day while cooking stove top jollof rice,i ran out of cooking gas,it was a sunday,while hubby tried to see which place was open selling gas on sunday or call the local gas man in the hood to bring one,i remembered baked Jollof but had never tried it. Honestly it woulda made lunch earlier that day as I have an electric oven.hubby even gingered me to transfer it asap to the oven but I didn’t want to ruin it. Now I see the steps, d baking temperature too! Will try it more confidently! Anyway we found cooking gas,lol, d jollof was bae! Lol! This oven method has not failed me. Makes my life so easy. Had some oyinbo friends over and they kept gushing about the Jollof rice. I have given them the link to this recipe as they want to try it. Hi, glad i stumbled on your site. If you could do all this awesome cooking and still call yourself lazy, well… hmm… hope you wouldn’t mind if I copied your content with a credit and backlink to your site? Hello there, I would like to try your recipe, but would like to know what type of rice you use. So! White wifey ( me ??) to a Yoruba man just cooked this! Thank you! I can’t – am lazy! To cook his food – it takes soo long! Like 20 steps before u finally get to taste the food! And hubby is amazing cook! Still cant forget his jollof he cooked when our son was born! Havent ate better tasting jollof since! My boy just had some for lunch and waiting for his sister approval as she is a fussy eater, hopefuly she will like it later on! My daughter and husband approved! Have to cook it again today! I thank You!!! My phone did not let me rate 5* but u have 10* from me! Hi Nma, thanks a lot for sharing this recipe. 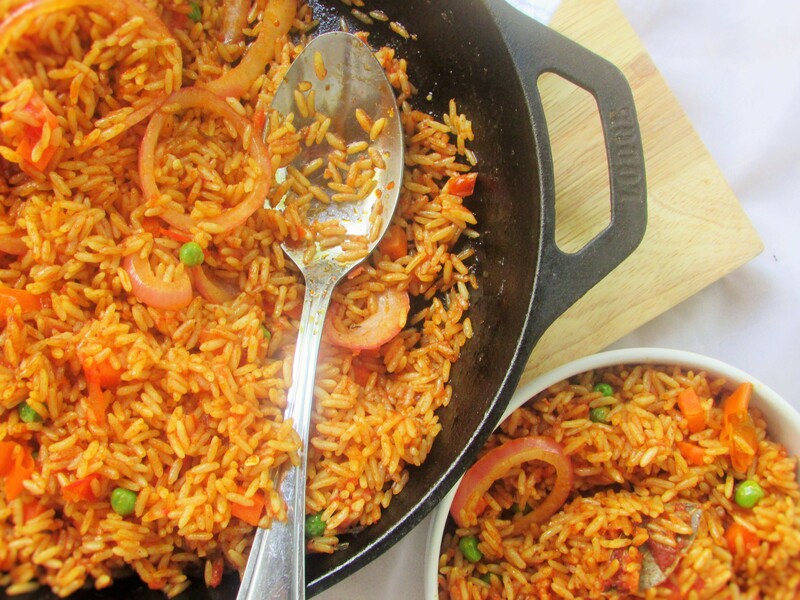 This was my first go at jollof rice and what can I say…I nailed it! 😀 My Yoruba hubby finished almost the entire pot on his own. It was too hot for the kids though, next time I’ll have to make it kid-friendly. I served it with chicken and next time I’ll make plantains as well to complete this delicious meal. Will definitely prepare more of these one- pot-oven dishes in the future. I stumbled on this post this morning 25th December 2018 and decided to try it out today as well lol. Mine got burnt although I like it. Still cooking though. So far it is looking good but my mum thinks the grains are hard. Thank you for this recipe! I follow some Nigerian women on Instagram and they are always talking about Jollof! with no African restaurants in my area, I looked for and found your recipe…admittedly I skipped the habanero pepper and had to sub an orange bell pepper for a red one, but it was delicious! thank you! This is amazing I am 12 and I’m using it for a project and the teacher says he loved it shout out to Tiko she is the one who gave me this website. She and my dad says “That teacher’s white he don’t know any good African foods.” LOL thank you anyway.